Connolly has been honoured for services to entertainment and charity. The Glasgow-born star said he wished his late sister and his parents were alive to see him knighted. As well as comedy, Connolly has also had a successful acting career, starring in the films Brave, A Series of Unfortunate Events, Mrs Brown and The Hobbit: The Battle Of The Five Armies. In 2013 he announced he was being treated for the initial symptoms of Parkinson’s disease, admitting he had started to forget his lines during performances. He was in London on Monday for a Downing Street reception, hosted by Theresa May, marking 200 years since Dr James Parkinson’s Essay on the Shaking Palsy. 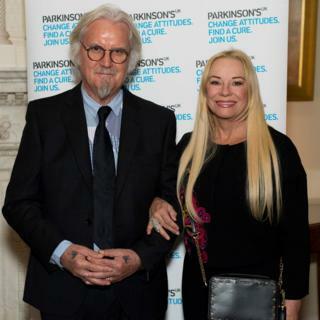 He was joined by actress turned clinical psychologist and author Pamela Stephenson, his wife since 1989.